I got 'em! I got W0O on 10.1067 MHz tonight. I thought that by the time I got home from work and then made dinner, it might be too late. After dinner, I turned on the KX3 and the computer. Turning on Reverse Beacon Network, I saw they were spotted on 30 Meters, but close to an hour earlier. I decided to give them a try, anyway. Tuning to the spotted frequency, all I heard was noise. "Drat! ", I thought I was too late. But before I turned the radio off, I decided to switch from the W3EDP to the HF9V. And surer than heck, there they were! As they were finishing up their QSO with someone else, I waited until they were done. I threw out my call as soon as they were done and got them first shot. Igor gave me a 559, and I gave him the same. We finished up and Igor went onto another op. For good measure, I spotted them on the Cluster as well as QRPSPOTS. I'm not eating candy, so this was my Hallowe'en treat. And please notice the correct spelling in the blog post title. It's Hallowe'en - not Halloween. 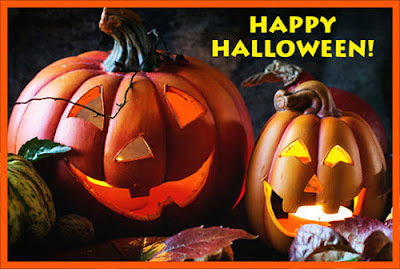 Hallowe'en is actually a shortened form of "All Hallows Eve" - the vigil night before the Catholic Holy Day - "All Saints Day". So be safe if you're taking your little ghosties, goblins or grand ghosties and grand goblins out for "Trick or Treat" tonight. For a unique QSL (4" x 6") card you MUST send a SASE to the address above. A No. 10 envelope is recommended. A smaller envelope will result in a folded card. 9) The 2018-2019 QRP Winter Fox Hunt Season officially begins next Tuesday, November 6th. I haven't made up my mind as to whether or not I'll be participating this year. 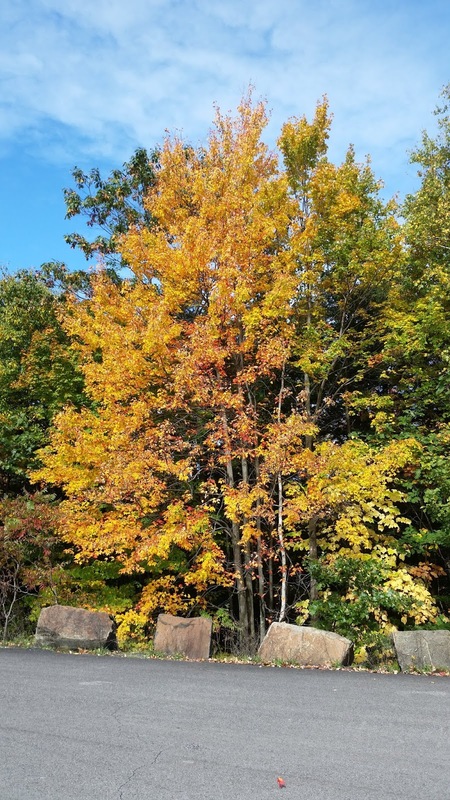 I sat out the Summer Season and I have to admit that I didn't miss it, too terribly. 20 Meters is always tough that time of the evening during the Summer. If the Fox is not in the Western third of the country, I usually listen to static crashes for 90 minutes. While 40 and 80 Meters are way better in the Winter time, and I generally have greater success - I don't know how quite to explain this. Since I'm not an avid contester, the competition factor of the Fox Hunts isn't really all that appealing to me. I enjoy snagging the pelts and keeping up on my "working split" skills. That comes in handy during DX pileups. But being the first in NJ to snag the Fox, or keeping tabs on how I'm doing against the other Hounds is pointless, to me. The Hounds in the center portion of the US have a decided advantage as they can pretty much work into all areas of the US, equally. The Hounds on the West coast have it particularly tough, as they start earlier, so local time and band conditions conspire against them. If I participate at all, it will probably be spotty at best. I'll probably start each hunt late, hoping that a certain Ham (who shall remain nameless) will have gotten both pelts before I even begin. His approach to Fox hunting is probably best described as the "shot gun approach" - call often, call long, and don't take a break to listen very much until you nab that pelt. Truth be told, that's what been making it uber un-enjoyable the past few seasons. His signal is always loud for me, making participation a less than sublime experience, as I end up hearing a lot of him and not much else. I'd rather just skip the twice weekly frustration. 1) What would morning be like without coffee? I'm thinking a gray, fuzzy catastrophe. 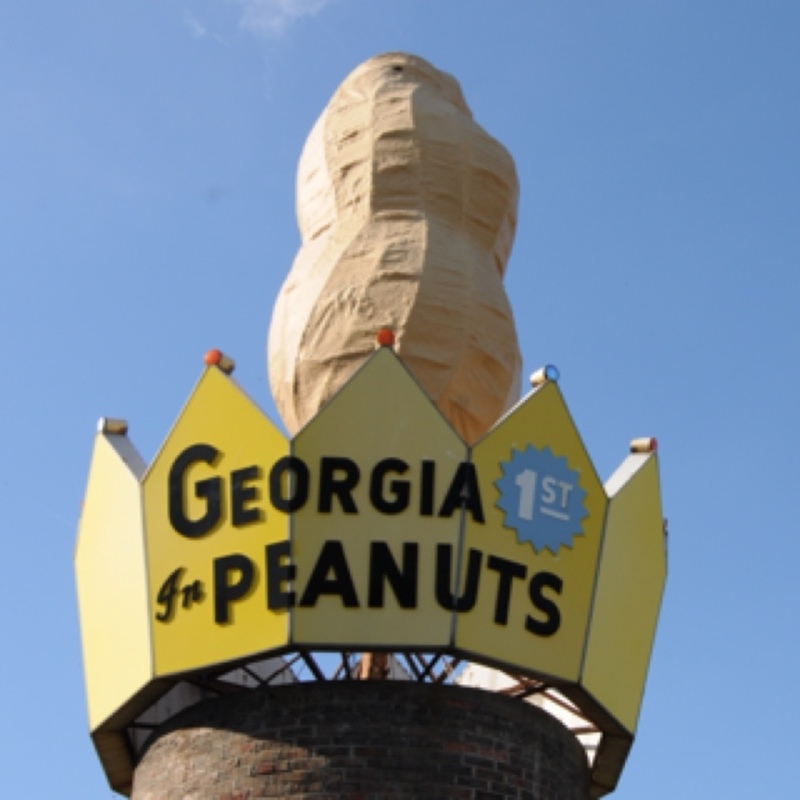 2) Guess I placed about normal for me in the 2018 Peanut Power Sprint - 5th place for my category. Look at that wide gulf in points between 5th and 1st. Not even close, by a long shot. 5) I can't wait for the midterm elections to be over, here in the USA. You simply CANNOT watch a TV program without some kind of political commercial. Hey ........ politicians .......... I think your commercials aren't going to change anyone's mind at this late date. 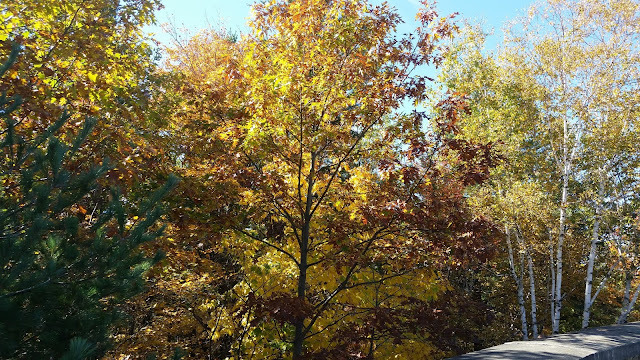 6) The weather has been so up and down here in Central NJ this Autumn. Past few weeks have been on the chilly side. 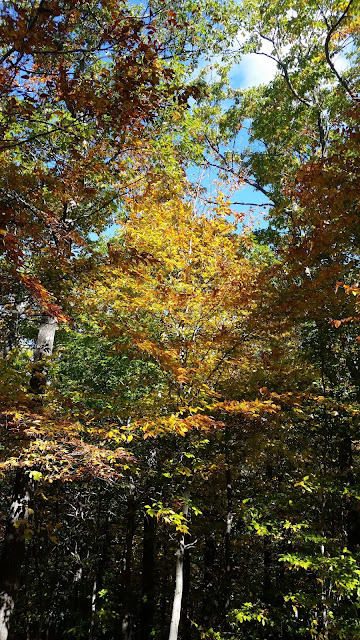 For Hallowe'en tomorrow, it's supposed to be in the low 70s. 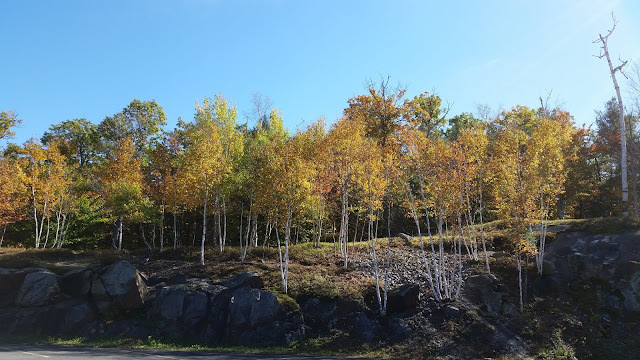 Indian Summer? Are we even allowed to use that term anymore? 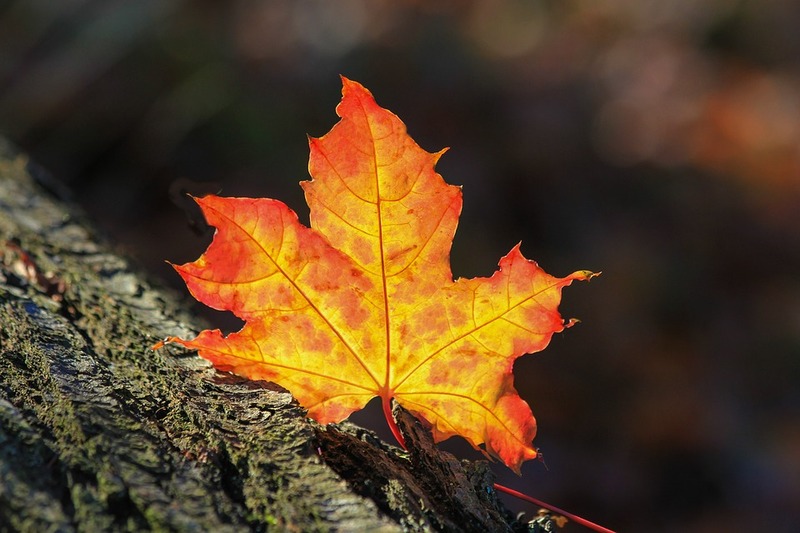 7) Daylight Savings Time ends this weekend. That means darkness will arrive somewhere around 5:30 PM local starting next week. Sad ...... so very, very sad. 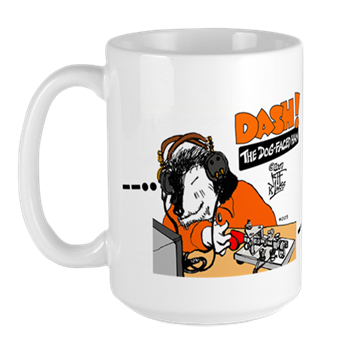 8) My friend Dave KD2FSI posted on Facebook that he worked a bunch of ATNOs in the CQWW SSB Contest last weekend. His excitement was palpable. The next best thing to working a new one yourself is getting to enjoy a good friend work one. A relatively new Ham or perhaps just a new QRPer wrote to the KX3 e-mail reflector. In his post, he mentioned that sometimes he identifies himself as "QRP" and asked opinions if "that's out of line." You're not out of line. 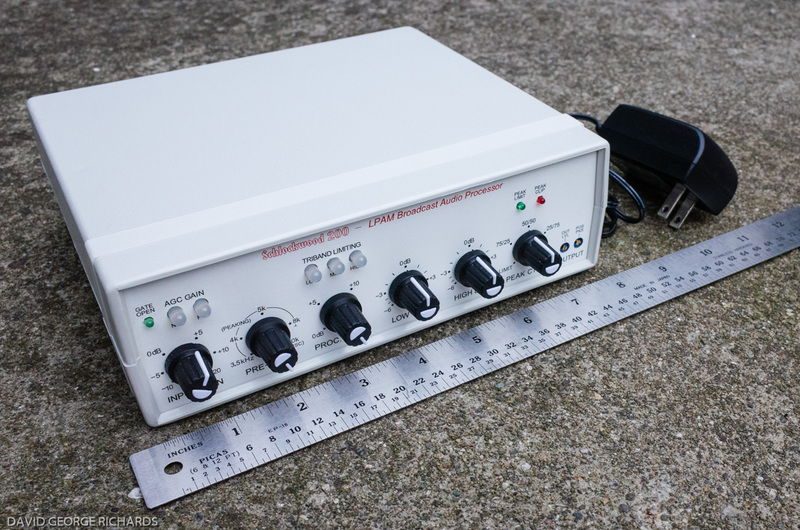 But you might sometimes run into "QRP Syndrome", where you are being heard perfectly well, but as soon as you mention running QRP power, the QSB and QRM and QRN magically increase, exponentially. Now, so far the sample of answers has been low, but an unexpected tone has been developing. There have been what I would unabashedly classify as "snotty answers". I would have expected better from the QRP community and I am hoping against hope these folks may be Elecraft users, but not necessarily QRPers. There's no reason to be snotty to anyone asking a question, especially a newcomer. You can only make one first impression; and if it's a good one, it may be forgotten - but if it's a bad one, it's remembered FOREVER! 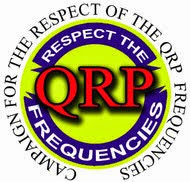 The QRP community, in my experience, has been a haven in Amateur Radio, where everyone that I have run into is friendly, helpful, enthusiastic and encouraging - almost like one, huge family. I'd hate to see that changing. Fingers are crossed that as I monitor this post, the kind replies will far outnumber the nasty, self-absorbed, ego-inflated ones. PSA - QRPGuys has re-opened. QRPGuys is open after the Summer recharge and announcing a new retractable tilt bail for your small project chassis. It can be seen at https://qrpguys.com/chassis-tilt-bail. Not having worked much in the way of new DX lately, I went on over to the ARRL Website to log onto Logbook of the World. With all the chatter going on about the Ducie Island DXpedition, I had forgotten that I had worked the island twice in 2008, back when all I had was the K2 and 5 Watts. While I was there, I wanted to see what my current country total was. By my own count, I was at 160 countries worked via QRP. Of the ATNOs above, I'm pretty sure that New Caledonia, Mozambique and perhaps Namibia were 100 Watts QSOs. The other six were QRP, so that would bring me up to 166 worked with 5 Watts or less. I'd have to go back and refer to Log4OM to be 100% sure about that, though. Once the sunspots come back, I'm closest to earning DXCC on 15 Meters. Only eight to go. Also, both 17 Meters and 10 Meters are close, but it's going to be years before band conditions improve enough to make those needed QSOs. May be a retirement project at this point. It was a mixed bag weekend, radio-wise. I got a late start with the Zombie Shuffle. Due to not getting home from work until 6:00 PM and then dinner, I did not get started until a bit after 7:00 PM. As the official start time was 4:00 PM local, I missed the first three hours and probably most of the activity. 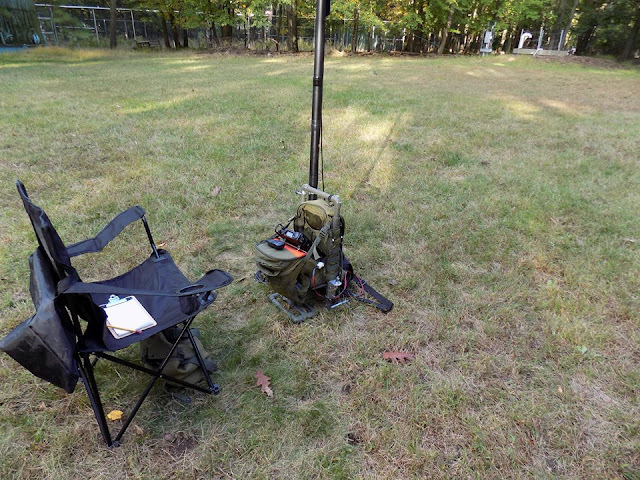 I ended up working only three stations - AB9CA, NK9G on 40 Meters and N9AW on 80 Meters. I could tell there were some stations on 20 Meters, but they were at ESP level. I knew they were there and that was about it. While talking with Bob W3BBO on Saturday evening, he informed me that he worked ten Zombie stations. He was wrapping up his operating at just about the same time I was beginning - so that right there tells me I pretty much missed the Zombie boat this year. 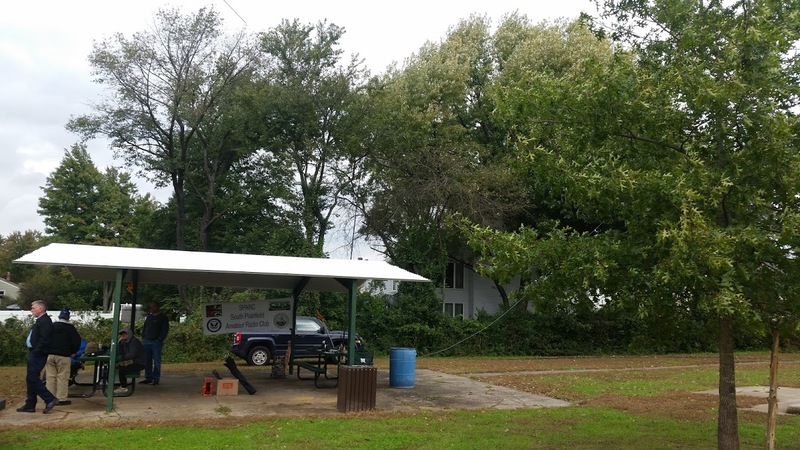 On Saturday, we set up at a local park in South Plainfield for JOTA - Jamboree on the Air, the annual Boy Scouts of America QSO Party, if you will. We had success working stations, but alas, no local Scout Troops came by to participate. I think part of that was the weather - it was heavily overcast, at times misty, breezy and quite chilly for most of the time. I think the other part was that we could have done a better job publicizing that we were out there. I think for the next JOTA we will post to South Plainfield's two Facebook groups as to what we'll be doing. All the Troops in town knew, as one of our members, Harry KC2PGX, is a Scoutmaster, but perhaps social media might draw more people. Dave KD2FSI brought a Jeep full of his portable equipment; and I brought forth my venerable portable backpack. My KX3 set up at one of the tables under a pavilion. I think the most essential piece of the day was the thermos of hot coffee! To start, the coax was running out to the QRP Guys portable vertical, but after a while, I switched over to the PAR END FEDZ thrown up in a tree. I was not getting me the results I wanted wit the vertical. I should have used my Buddistick. My Jeep was close enough to where I could have just popped it on the roof with the magmount, and with a barrel connector and some extra coax I would have made it to my operating position. That setup has worked so very well for me in the past. Too bad I didn't have the presence of mind to think of that on Saturday morning. One of the hazards of growing old, I guess. Dave KD2FSI making contacts on 20 Meters. We switched back and forth so as not to interfere with each other, but for the most part Dave stayed on 20 Meters while I stayed on 40 Meters. Dave's Jeep Wrangler, on top of his drive on mast. This supported his 20 Meters Buddipole configuration. For 40 Meters, Dave put up his Jackite mast with the EFHW wrapped around it. In this case, he added a Buddipole HF coil and an elevated counterpoise wire. You can't see it (at least I don't think you can) in this photo, but the PAR is going from my radio which was located toward the right hand end of the pavilion to the tree at the right hand end of the photo. In addition to a few JOTA stations, I also worked DF8CX with QRP power. Much to my chagrin, I was not able to detect or hear any JOTA stations on CW on either 40 or 20 Meters. I brought the microphone along and used that to work the few JOTA stations that I was able to. Even though I was kind of out of my element, it was fun talking to the Scouts and I was even able to speak with a couple who were close to attaining their Eagle Scout status. For the heck of it, I worked a couple NY QSO Party stations with the paddles, so it wasn't a total loss. And of course, as we were packing up for the afternoon, the sun started peaking through the clouds and began to warm us up. Just in time to go home. It was time for a new call sign hat. The old one, which was my favorite for years got pretty gross looking. It was a khaki color, which turned out to be not the wisest choice I've ever made. I wore it everywhere and while doing everything and it just became sweat stained. Badly sweat stained, I might add - way past the sweat band and into the hat fabric itself. What can I say? Doing yard work in hot New Jersey summers in sweaty work! I tried several washings with Woolite, and that helped a little and extended the life of the hat a couple of years. But when you look at it, and say to yourself, "You're NOT wearing THAT, are you?" - you know it's time to retire it. So I went back to where I got the old one from - Astrid's Embroidery - and ordered the Next Generation. This time I went with Navy Blue, a dark color which will hopefully not show any sweat stains as readily. If past experience is any guide, a dark color is way easier to maintain with regular washings. I just fill the sink with tepid water after adding a splash of Woolite, soak the hat for a bit and then set it out on a towel to dry. That usually takes an entire day or two, but results in a brand new looking hat. Like my old hat, this one has the same embroidery on the front, as well as the straight key on the side. This "Next Generation" features something new, the NAQCC logo on the other side and my name and call at the back, just above the adjustable band. I really like the workmanship that WM8C provides. He really does produce a fine quality product. And I am pretty hopeful that with the proper care, this hat will last me way longer than the first one, now that I've made a wiser choice in color. Oh, and by the way, while the old hat is retired, it might be better to say, semi-retired. I'll still use that one when I'm outside in the summer, mowing the lawn, trimming the bushes, or whatever. In true Ham fashion, I'm too "personal economy minded" to throw a perfectly usable, if somewhat groady looking, hat away. 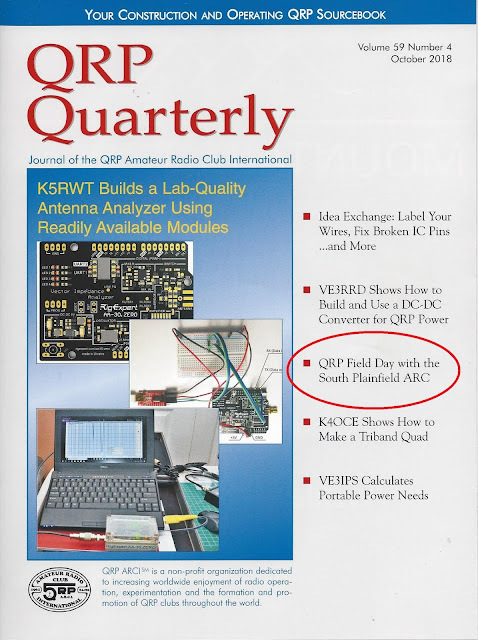 For those of you who are paid up members of QRP ARCI, please take a look at the October 2018 edition of "QRP Quarterly" when it arrives in your mailbox. 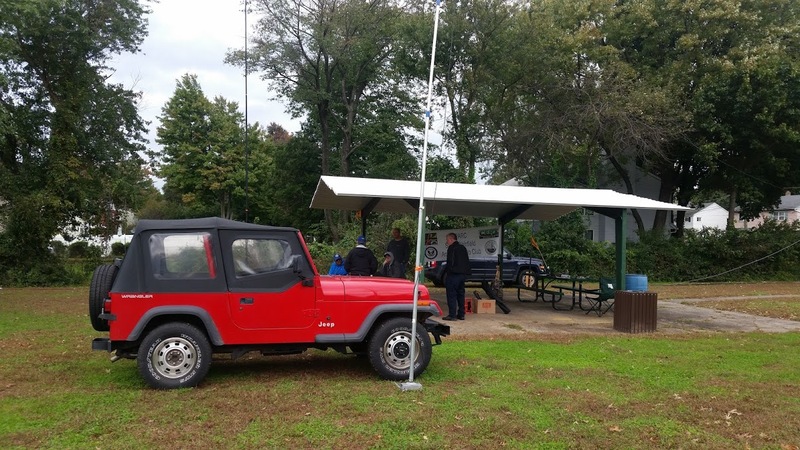 The South Plainfield Amateur Radio Club is featured in an article this month. The red oval is just my highlight, of course! The 2018 Zombie Shuffle is THIS Friday evening - October 19th, 2018. This is one of those "Fun" QRP events - I know, they're all fun - but this one has earned a rightful place in the QRP Event lexicon. To testify to that is the fact that this is the 21st annual Shuffle, the first one was held on October 30, 1998. For an event to be entering its third decade of existence, especially in the QRP world attests to its popularity. 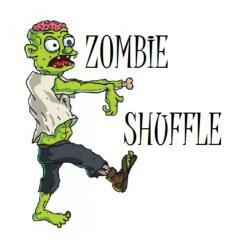 So come out and join the Zombies who will be shuffling this Friday night - remember ...... Zombies shuffle, because they can't run! Any Morse Code "newbies" out there should especially take heart (I sense some kind of pun there). Since this is a "shuffle", medium to slower to really slow code speeds are highly encouraged. 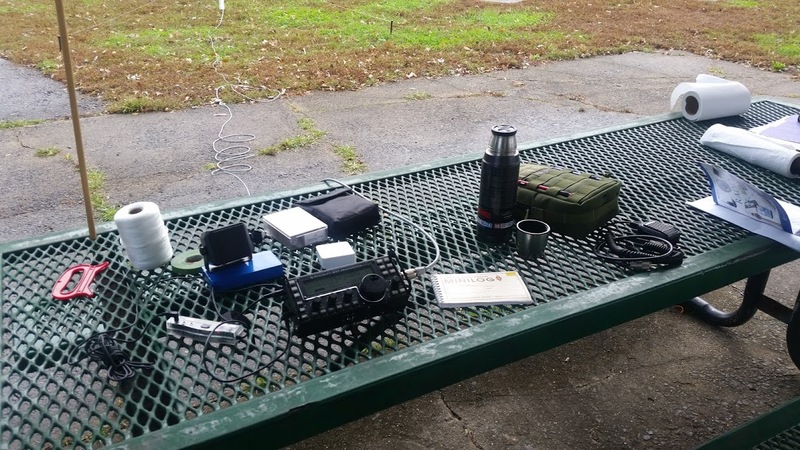 So, if you've never entered a QRP event before because you're not confident of your Morse ability - have no fear! This is the event for you! Just come and shuffle along with the rest of us - you will be welcome and you'll see how much fun an event like this can be. And you'll be hooked - guaranteed! 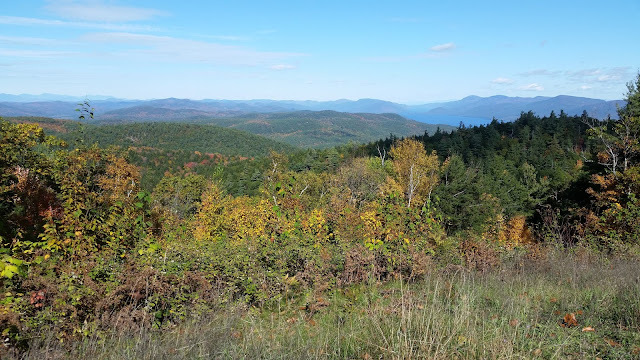 This past weekend, Marianne and I went up to Lake George. Not a long stay - we left on Saturday morning and came back home yesterday - Monday. No radio equipment taken, just some time spent with my wife (alone), with the two of us going North to enjoy the beauty of Nature. Saturday and Monday were rainy, but Sunday was magnificent! There was a post to a CW reflector that I belong to that I can sympathize with. 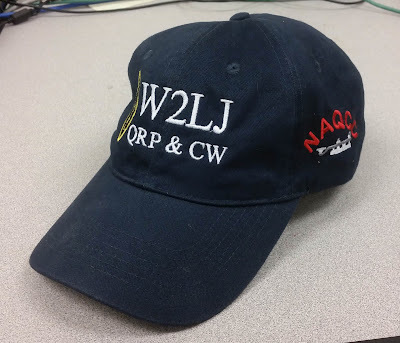 In essence, the author stated that he was running a frequency last night as one of the NAQCC Anniversary stations. A mini contest/sprint came along and he was run off the frequency that he had been occupying. His complaint was that it appeared to him, at least, that the offending station hadn't bothered to listen adequately for activity on the frequency. Apparently, there was not much of a wait time after a "QRL?" if indeed there was a "QRL?" at all. This is one of my pet peeves. 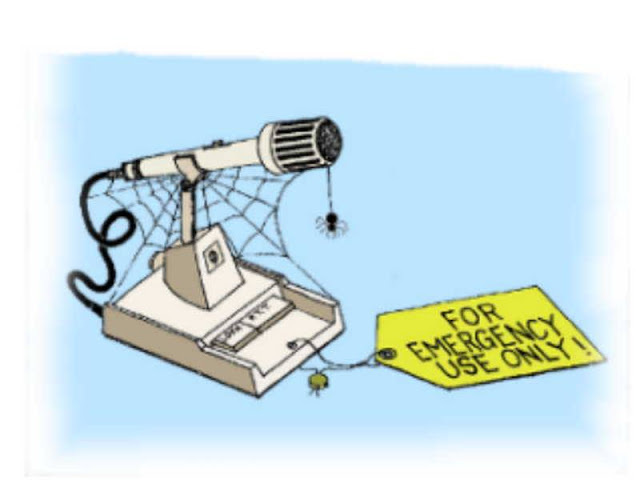 There are so many operators that will just jump on a frequency without listening AND without bothering to ask if the frequency is in use. VERY poor operating etiquette. Whether a frequency is occupied by a QRPer or not is not the issue! The issue is that one operator jumped onto an occupied frequency (seemingly) without bothering to adequately listen. Period. End of story. Now, I'm fully aware that QRPers are often not heard all that well. That's understandable. Many is the time I've been knocked off frequency by a QRO station. If the station who knocked me off frequency "QRLed" a time or two AND gave adequate time to listen - I have no beef with that. That person did their due diligence and I cannot fault them - he/she couldn't hear me, they truly believed the frequency was clear. I get that - that's the way the cookie crumbles sometime. But for someone to not listen beforehand and transmit blindly - or to send a "QRL?" and listen for only two or three seconds before starting to transmit is inexcusable in my book. That so many ops of this somewhat prestigious group are so dismissive of this is disappointing to say the least. Smacks of snobbery, arrogance and entitlement. Did you ever hear that phrase ? "Genius is the mother of invention"
Dave Hackett KD2FSI has come up with another great idea. 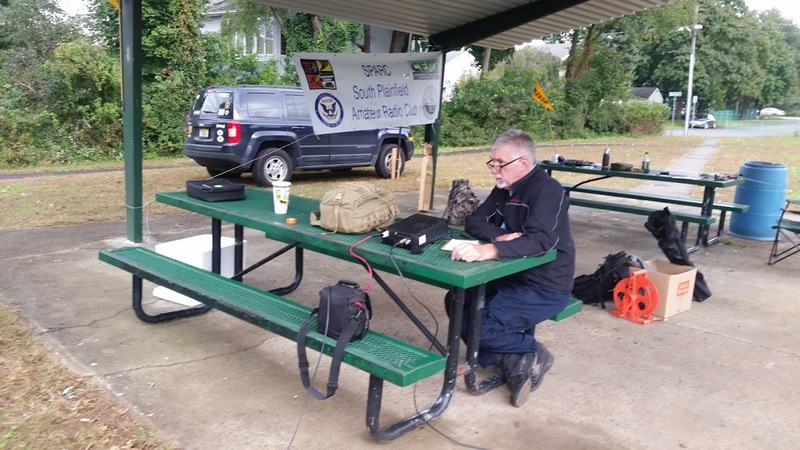 This started a few weeks ago when we were doing that Amateur Radio demo for the Boy Scouts at Sandy Hook. 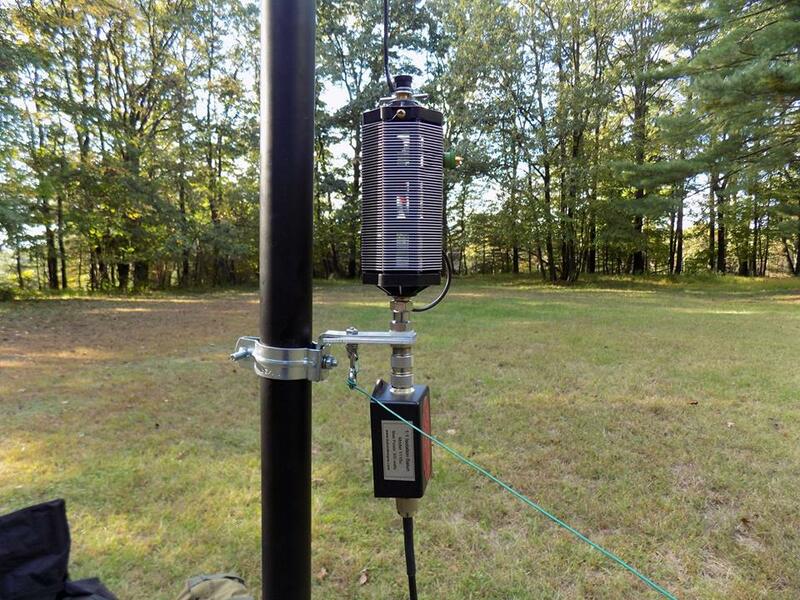 Dave spirally wrapped a wire around his 31 foot Jackite pole and was using it as an EFHW antenna. 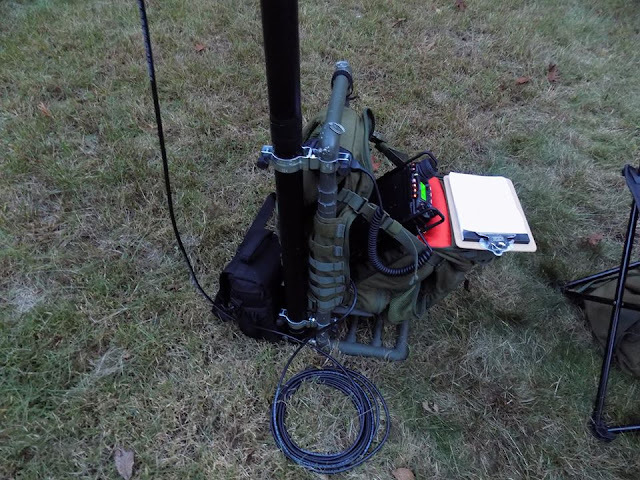 He bungee corded it to his portable ops pack as a self standing unit. For the most part it worked until a stiff off shore breeze came up and threatened to tumble everything over. Realizing that discretion is the better part of valor, Dave removed the antenna from his pack and lashed it to the infrastructure of the wooden deck that we were operating from. He (and I) like the idea of being able to use the pack as ballast, though. So in the best tradition, Dave went back to the drawing board. This is what he came up with. By reinforcing his pack frame a bit, and then attaching some large clamps, he was able to accomplish what he first intended. So he now has a deploy-able antenna for 20 and 40 Meters, but also for 80 Meters when he adds the coil. 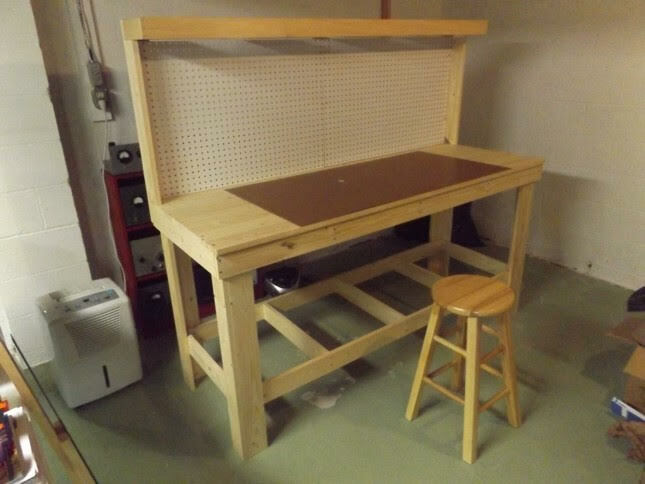 And since it's free standing, he has a solution for tight quarters or when there are no trees or other supports available for a more "conventional" horizontal wire. 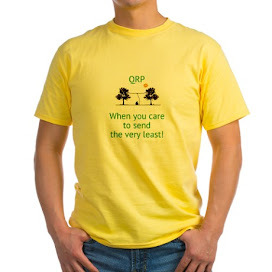 QRP _ When you care to send the very least! Score: Final Score = Points (total for all bands) x SPCs (total for all bands) x Power Multiplier. BONUS POINTS: None available for this contest. Contest logs are not required for entry, but may be requested by the Contest Manager if required. Deadline: Entries must be posted on or before 27 October 2018. Certificates: Will be awarded to the Top 10 Scoring Entrants. 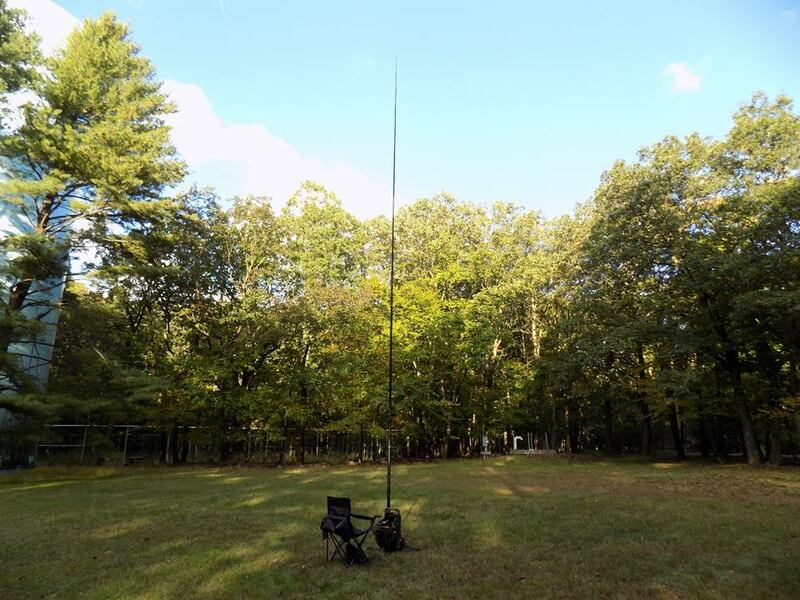 I will be away from the shack for this one, but the seasonal QRP ARCI Sprints are always fun! My sister is four years older than me; and she knows her brother very, very well. She's on vacation, heading towards New England and yesterday she and her husband stopped at Hyde Park to visit the Roosevelt residence. "Here's a pic from the "Art of War" exhibit. I thought of you." No, no, no. Of course, I'm not a WAVE nor have I ever been in the Navy. But from hanging around her little brother, my big sister DOES know what a bug is; and she can pick out a Morse Code apparatus when she sees one. I've often thought that if I could somehow travel back in time, there are two periods of American history that I'd like to eyewitness. The first would be our Colonial and Revolutionary War period. 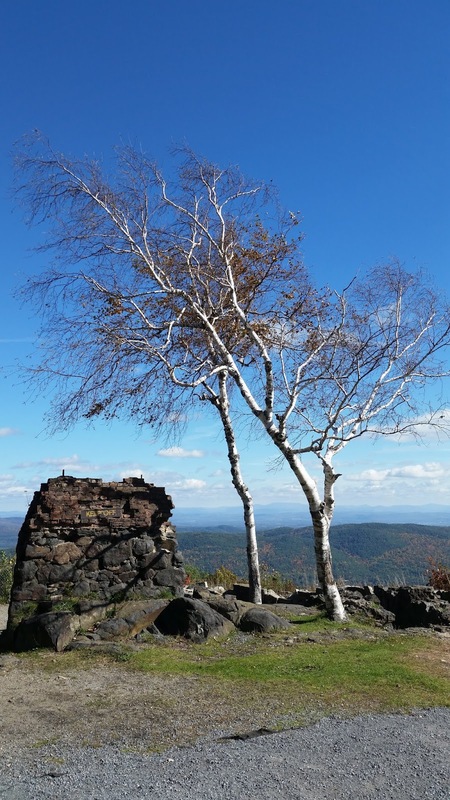 I'm a bit of a Revolutionary War buff and am fascinated with that era and our founding. The big thing for me would be radio, of course. Television as we know it was in its infancy and was not common. Broadcast radio was the rage. 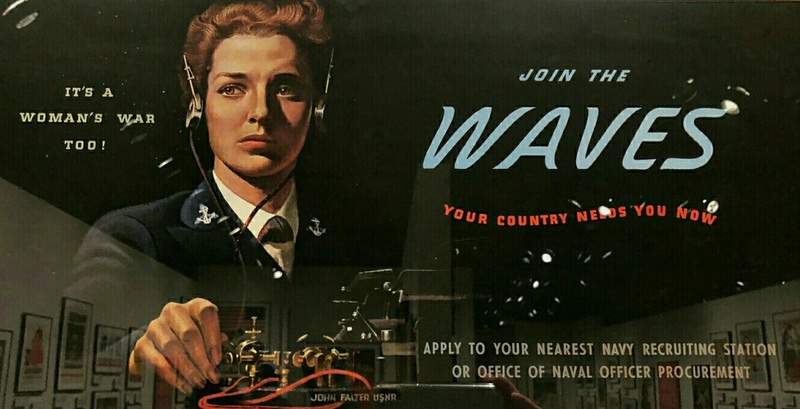 Although Amateur Radio was shut down for the war - plenty of ops were performing communication duties for the military. My Dad, who had no interest in Amateur Radio whatsoever was attached to the Signal Corps and was part of the group sent to Britain to work on the RADAR development project. Maybe that's where my radio gene came from! If I was living back then, I am pretty sure that I would either be doing something like that; or if I was classified as "4F' for whatever reason, I'd probably be doing radio repair. 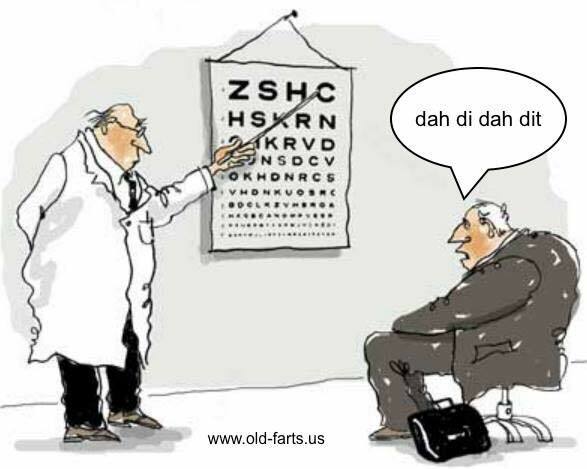 next time I go for an eye exam. 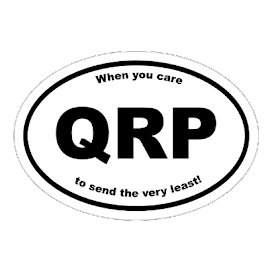 QRP - When you care to say the very least! Unfortunately, my weekend wasn't as "QRP Heavenly" as I had anticipated in my earlier post from last week. On Saturday, the Simulated Emergency Test took out a big chunk of my day. In addition to that, grocery shopping, mowing the lawns and chauffeuring my daughter back and forth from the SATs pretty much killed the day. Our SET exercise was a success, though. We simulated providing AUXCOMM for a freight train derailment in town with a fire and hazardous material spill as part of the scenario. 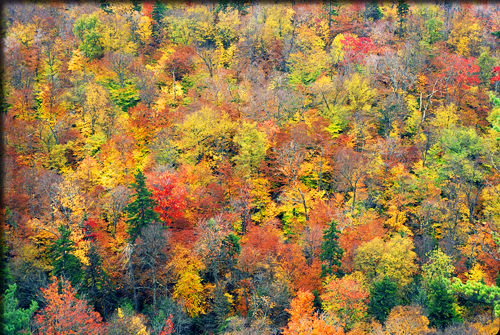 That meant that unfortunately, the Leaf Peepers Sprint was out of the question for me. And I am truly disappointed to have missed that inaugural event. My apologies to Tim W3ATB, who worked so hard on bringing this off. As the Brooklyn Dodger fans were famous for saying ....... "Wait 'til next year!" Sunday was a bit more generous to me. I was able to participate in the Peanut Power Sprint. But even there, I am such an idiot at times! I was going by previous years and started looking for activity around 4:00 PM EDT. Not hearing any, I thought maybe the bands were swallowed by a CME or other solar event. An e-mail from W3BBO alerted me to the fact the Sprint had been moved up two hours. And I complain when people don't read ....... I'm just as guilty as the next person! Much to my relief there was a decent amount of QRP activity at the proper start time (duh!). In all, I managed to work 18 stations. I didn't operate the entire time as the dinner bell rang at 7:00 PM Also, I didn't set up as a portable station outside, either - I sprinted from the basement shack. With the PPS now running from 6:00 PM to 8:00 PM EDT, I didn't feel like disassembling the station in the dark - it's pretty much pitch black around here by 7:15 PM. I hate this time of year. As much as I hate the cold that will be coming shortly, I hate the loss of daylight even more. Dark in the morning when I wake up, and dark way too early in the evening. I can't even mow the lawn after work now, as it's too dark by the time dinner is finished. That's just one more chore that now gets moved to already jam packed weekends. Ugh. The ONLY good thing about this time of year is that 80 and 160 Meters will become usable again. Summer thunder static will decrease more and more each week as we head towards autumn type weather. You have to find your silver lining where you can get them. QRP Heaven this coming weekend! Not one, but TWO QRP operating events coming up this weekend! If you get a chance to participate, please do! These QRP Sprints, operating events, whatever you want to call them - they're a real labor of love. 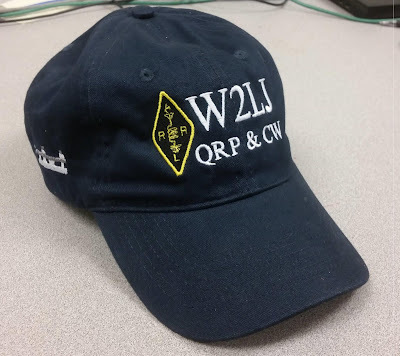 The guys and organizations who sponsor these do it out of love for Amateur Radio and especially for the love of QRP. Their one and only goal is that YOU have a good time. Your participation is the only way they know that their efforts are appreciated. Besides, there's so much CRAP happening right now. Here's a chance to get away from it for a while, clear your heads and have some fun. This might be the greatest gift of all! Fellow Zombies, This year's Zombie Shuffle will be held on Friday, Oct. 19, 2018. A bit earlier than usual due to Halloween being mid-week and to avoid the CQ WW SSB contest (which trashes evening 40M) and the ARRL CW Sweepstakes. 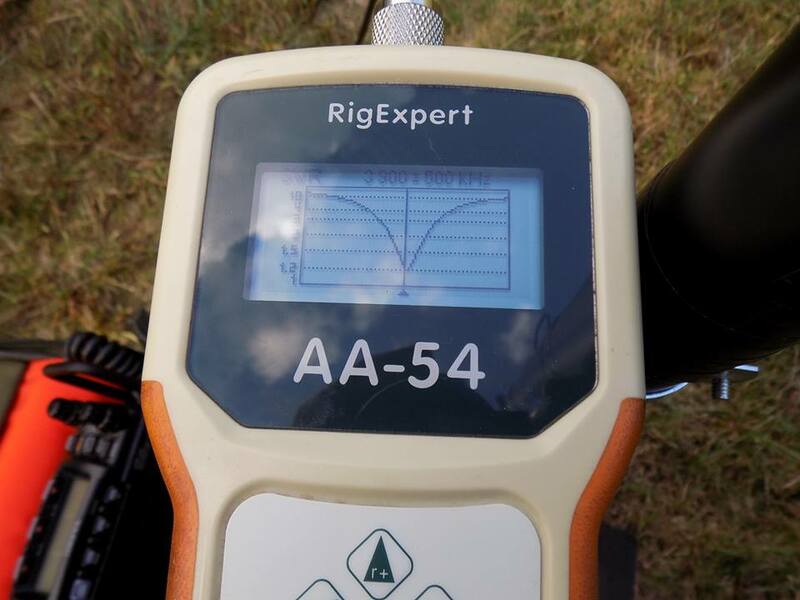 With the poor solar minimum propagation, we don't need any more QRN/QRM to hinder making QSOs. Contact Jan N0QT ... n0qt@zianet.com if you need a Zombie number assigned or you forgot yours (they're good forever). If you're new to QRP, the Zombie Shuffle is an annual event just to get on the air, make some QSOs, and have a good, silly and absolutely meaningless good time while making a big score for only a handful of contacts. 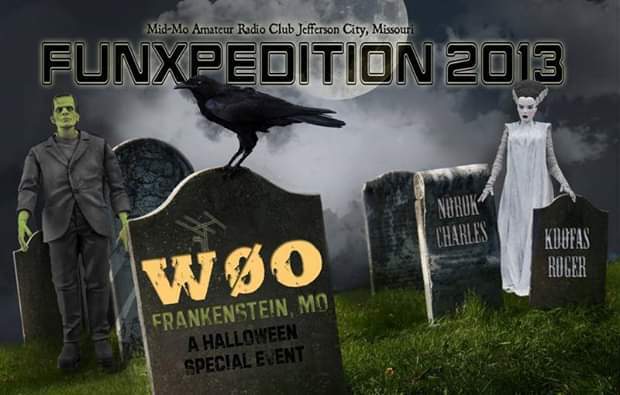 This year's Zombie Shuffle is dedicated to our friend, Ron Polityka, WB3AAL (SK), our longest serving Elvis station and a contact in our logs sure to be missed. If you would like to serve as an Elvis or Elivira station, just let me know. This is welcome news to yours truly! The following Friday is a regular club meeting night; so I would have missed most of the Shuffle were it to be held on the 26th. Once again, thanks to Paul and Jan for hosting this fun event. A lot of people look forward to these "meaningless good times", and it's good to see that they are not going by the wayside.